You must make reservations at least 5 minutes in advance of the time at Restaurant at The Hotel Tides. We strive to keep you entertained. We offer art openings monthly and feature local artist at least twice a month. A full selection of events is always available at www.hoteltides.com. Featuring New American Cuisine, our chef highlights fresh, seasonal, and local ingredients. Helping to feed the "Farmer to Chef" trend, local markets are key ingredients in our menu at the Hotel Tides. The whimsical, intricately detailed tin ceiling and walls - dating back to the 1920's - demanded a ten month renovation, showcasing the cultural heritage and history in modern day Asbury Park. Very happy with our choice to try out Hotel Tides. Service was very attentive. Food was delicious. Hope to return again sometime soon. Lives up to its reputation of Asburys best restaurants. What a great spot! Our server was so nice, fun and funny and the food was amazing! Will definitely be back. There is an old saying:Too soon old. Too late smart.” Well, I got smart by finally trying the restaurant that is just a block from my home. The atmosphere was warm. Elegant The food delicious. Brilliantly imagined. Like the delicate paella. Oh I will be back. Now that I am smart. A hidden gem in Asbury! Menu is small but every item on it is superb. As a teenager (50 years ago) I worked in the Tides and was very close to the owners. This was a great visit. This is our second time at the hotel tides restaurant and we will go back again! Charming spacious dining room with expansive,comfortable tables, crisp white tablecloths, wonderful cocktails, very friendly fun server and delicious food. Really enjoyed it. As always, excellent food, service and ambiance...we have never had a bad meal here and the waitstaff is expert, prompt and usually very funny! The menus change by the season and are often experimental and always interesting. Excellent wine list! Hotel Tides was a great local spot. Everything we ate was delicious. We had the two specials and the jumbo lump crab spring rolls and finished with the cheesecake. Would recommend. Awesome as always. Chris is the best. Always love dining or having a cocktail at the bar at The Tides. Was celebrating the Christmas season by having a delicious meal there with my cousin. The main course was outstanding (John Dory special). Dessert (cheese cake) and espresso were mediocre. Best food I’ve had in a long time and the service was excellent as well! Great food and terrific service. 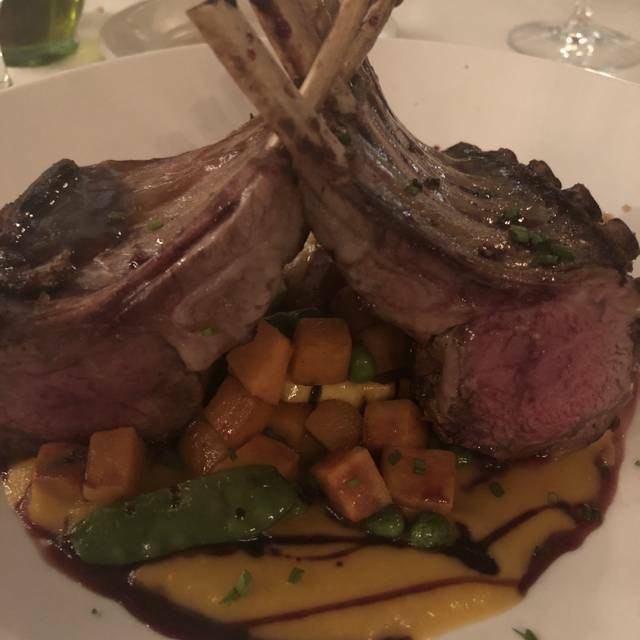 We ordered the rack of lamb and the short ribs and both entrees were incredible. The service was great! The food is really good. The staff was attentive and professional. Thanksgiving Eve Dinner was a joy - delectable food, impeccable service and atmosphere - sublime! A truly perfect experience which we look forward to relocating very soon. Love this quaint old place. Cozy atmosphere, polite service, great food. I ordered a rack of lamb and got 8 ribs. Unbelievable. Great honest martinis. Just. Delightful place and well worth the one hour drive from our home It’s out special occasion place. I'm actually writing this review because we had a reservation here for 9 people on a friday night. We were coming a long way to have dinner and then go to a play in Deal. There was torrential rain, flooding and traffic all the way. I kept in tough with the restaurant for our time frame. After 6:45 we knew we were never going to be able to have dinner in time, so I asked if we could cancel. Most restaurants would have been very mad. The gentleman here could not have been nicer and wished us safety on the road. Another couple who lived closer, did go for dinner. They are FOODIE'S and loved the food and met our gentleman. I will try to go another night. Went to celebrate my mother in laws 80th Birthday. Food was awesome. Staff and service were amazing. Highly recommend. 4th time I have been there. Each time was great. No one was there when we arrived. Only one couple when we left. We like it this way - very quiet and the service was great. But the food we average (we sent back the "veal tenderloin" that was only a very dry veal chop). The price was outrageous excepy for bottles of wine. I heard great things about this little gem of a restaurant and was not disappointed. It's nestled in the back of what appears to be a long forgotten bed and breakfast from the 20s or 30s. One step through the door though and you're instantly transported to it's heyday, half expecting to see bowler hats on the bar or a lounge singer adorning a flapper dress. Cocktails were delicious and the food was very good. Not "best meal I've ever had" good by far, but still a strong showing with inventive dishes and reasonably complex flavor profiles. The unique ambiance of the dinning room, live music (and even tap dancing) echoing in from the lobby bar, as well as the friendly service all helped to craft a memorable experience. If you're looking for something different for your next date night or special occasion, the restaurant at Hotel Tides is definitely worth checking out. My wife and I were looking for a place to celebrate our wedding anniversary just a couple days early and went here based on suggestions of a few friends. Start to finish, though, it was an experience in mediocrity. Very dreary dining room, bland service and bland food. The food wasn’t bad per se- we had crab spring rolls (too dense to properly be called spring rolls), capellini fra diavlo (that my wife modified to be mild, so the chef was kind enough to change the sauce to a marinara), short ribs with grits and an order of brussel sprouts. Everything needed salt and pepper- not just the proteins but the sauces and sides were all badly underseasoned. Tiramisu was just average. My wife’s cocktails- a dirty vodka martini and an espresso martini- were made well. Service was just blah- he had zero personality and only offered the most basic of service. When I made our reservation I noted that we were celebrating our anniversary yet no mention was made- not like we were looking for a song-and-dance routine, but some acknowledgement would’ve been nice. Lastly, while the tin ceilings were a nice throwback touch to the decor, the room as a whole was very dank and depressing. We won’t be back. First visit and I'll go back very soon. Excellent food and atmosphere. You'll enjoy for sure ! The food was way over priced and that good. We were glad we had a gift certificate. Sorry to say because it has a lot of potential. A hidden gem. The food, ambiance and service were outstanding. We have been passing by this place for years and had no idea it was this special. I stayed an the Tides Hotel years ago and loved the feel of the bar and restaurant, but had never eaten there before. Six of us went for dinner and everyone of us said it was one of the best meals we ever had. The appetizers, especially the Mexican shrimp and the calamari. The entrees, short ribs, pork Milanese, swordfish...everything was outstanding. We had no room for dessert, but we'll be back...soon and often! Romantic, quiet, excellent food, service and background music. Our very favorite restaurant to go to for special occasions. Actually, I would go there anytime. Outstanding menu and service. Fabulous choices. Beautifully prepared. Delicious. Wonderful, creative cocktails. Wonderful service. Beautiful. It was fine, even good, but not amazing. I don't really understand the hype -- it's definitely a hot spot, but just not sure why. Might go back and sit at the bar which seemed lively and fun -- the dining room is a big block of open space with interesting tin ceiling and wall decor that probably added to the loudness. It was one of those places we felt we had to try, but it didn't live up to our hopes.